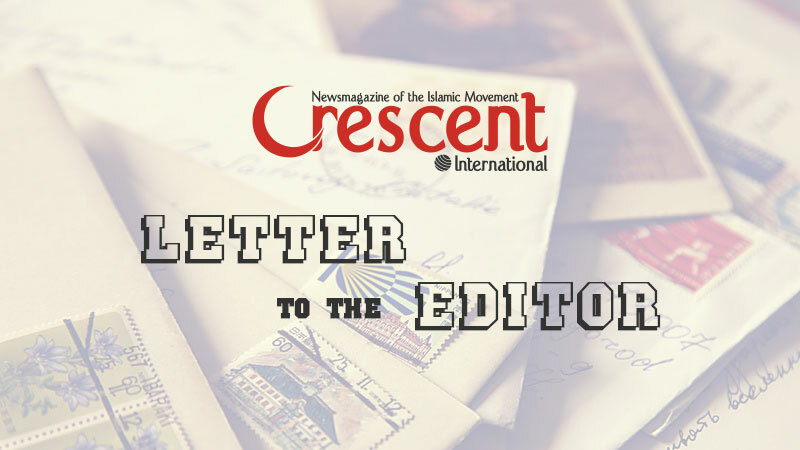 With recurring tragedies virtually every Eid, Muslims should not accept the excuses offered by the Bani Saud. They must be held accountable for their negligence and incompetence. It is with great sorrow and a heavy heart that the hand finally finds the strength to write words of sympathy even to self for in the circumstances, for others there can really never be anything useful—or comforting enough—to say. But by convention, one must express heart-felt (heart-petted) condolences to the Muslims of the world over the usual, never-ending, annual, heart-rending tragedies associated with the Hajj. Our tears have not yet dried, our anguish has not yet abated, nor has our anger diminished over the crane collapse tragedy in al-Masjid al Haram in Makkah in which more than 115 people died with several hundred others were injured. 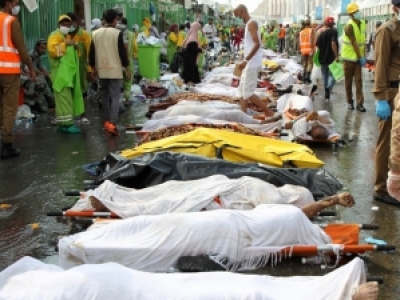 We heard news of the September 24 predictable, preventable but permitted stampede at the Jamarat, in which more than 2,000 hujjaj died (the Saudi regime has admitted to 769 people dead so far) and 865 people injured. What words of counsel could one give to heal the trauma of those who witnessed this horror? What assurances could one give to lessen the fright and panic of the survivors who had to complete the rites of pilgrimage under the shadow of that forest of cranes looming over al-Masjid al-Haram? But why must this series of preventable tragedies be a part of every Hajj gathering? And why are Muslims rendered insensate in the face of mounting casualties year-in, year-out? There are many reasons but none of them can stand scrutiny. Our tears have not yet dried, our anguish has not yet abated, nor has our anger diminished over the crane collapse tragedy in al-Masjid al Haram in Makkah in which more than 115 people died with several hundred others were injured. Accidents do happen but they never do so without a cause; and when they become routine as a result of negligence with abandon, and with repercussions like these, they should never be accepted with resignation by its victims, nor should excuses be accepted with complacency. The first thing that we must do is to understand that these accidents are not Acts of God in the manner they are portrayed. Just because God allows an event to occur doesn’t make it His act, and nor does it make Him culpable. The regime of the Kingdom of Saudi Arabia is fully responsible for this tragedy. In the case of the crane collapse, it can no longer escape blame by blaming God, as if He acts without a cause; or try to pass the blame by holding the Bin Ladin family scapegoat, as if a contractor in the kingdom is supposed to supervise himself. Saudi preliminary investigation has already established that the collapsed crane was not properly secured; the contractor hadn’t implemented proper follow-up safety protocols as the circumstances demanded especially as the storm developed. The crane manufacture’s guidelines required that, when not in use, or when storms or strong winds are expected or forecast, the arms of the cranes should immediately be taken down. In this case, they were not. And then three million pilgrims are expected to concentrate in one area. That forest of cranes over the Masjid al-Haram should have been disabled and stood down but that would have happened if the lives of the pilgrims were of consequence to the authorities. As was visible from the horrendous pictures beamed by social media, even after the collapse, there was no rapid response by first aid groups, by the civil defence or by paramedics during the crucial moments in its immediate aftermath. The provision of a safe environment, the necessity for a methodology of ensuring orderly conduct, the need for providing logistics for round-the-clock regulation of human traffic and showing human sympathy and Islamic hospitality to the guests of Allah are never among their priorities. If they really cared about the lives of the pilgrims, they would have paid more attention to their safety and comfort. If they cared about the fate of the pilgrims, they would, for instance, have laid the foundations of fast and comfortable railway links to connect Jeddah to Makkah and Madinah. If they really care about pilgrims, they would have concentrated on providing affordable hostels to the majority of the poor who cannot afford the international hotels they are busy erecting on the graves, homes and history of the first Muslims, instead of leaving them to the mercy of shylock Saudi landlords with their substandard, unfurnished accommodations. If they really cared about pilgrims, they should have honoured and treasured their brief companionship instead of showing open hostility to them, especially those from Africa. There had been several previous atrocious outrages as a result of Saudi contempt for pilgrims and a careless attitude towards their safety that resulted in the death of several hundred each year. In the 70s and 80s and before, the days of the symbolic ‘Stoning of the Devil’, for instance, used to be and had generally been accepted as synonymous with the day of mass death. Without exception, these deaths were the direct result of an official failure to anticipate, control, direct and manage the otherwise tumultuous and chaotic human traffic. Criticism of this conduct had not been well taken or ignored by the regime and had often been derided by its minions and apologists; but, in the end, after decades of avoidable carnage and the continuing exposure of its incompetence, persuaded it to reluctantly begin to take the very same steps critics had been urging it to take for years. Within the last decade, that is even after they have only reluctantly and perfunctorily taken some of the suggested steps, for instance, there was no year in which hundreds of pilgrims didn’t die in the scramble of those days. Two accidents this year alone within the space of two weeks of each other—the crash of the construction crane on Masjid al-Haram and the orchestrated stampede of September 24—more than two thousand people had died within the space of 14 days. 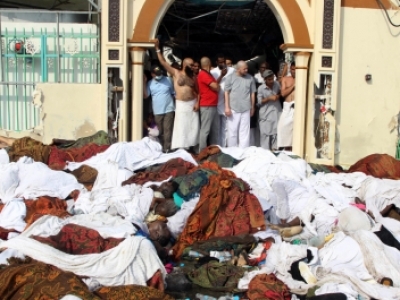 The point of stampede always revolves around the Jamarats; and for the last 40 years, the Saudis have only succeeded in telling the world that they are unwilling or incapable or unable to protect the lives of pilgrims and that the Muslim World must accept these deaths as inevitable. And within the last 25 years, evidence of their negligence and incompetence will seem to have been proved—if proof is really needed. On July 2, 1990 pilgrims stampeded in the tunnel leading to Mina and 1,426 people were officially confirmed dead. Four years later, 270 people died in the stampede at Mina proper; and three years after this tragedy, on April 15, 1997, to be precise, another disaster, in the form of a fire at Mina, killed 343 persons and injured more than 1,500 others. 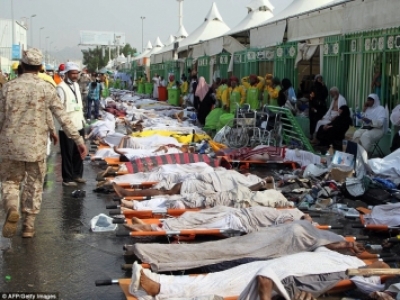 The following year, more than a hundred people were killed in another stampede at Mina and almost 200 were injured. On February 1, 2004, 251 people were killed and 244 injured during another stampede on the Jamarat Bridge; and on January 12, 2006, more than 346 pilgrims died and 289 were injured on the same bridge. And they call all these atrocities ‘acts of God’. The whole safety programme for pilgrims is more evident by its absence, and it seems to feed on the innate inspirations of many believers to die in the Holy Land, to pass away especially in the vicinity of the Holy Prophet (SAW); and for this very reason an act of negligence that should have provoked Muslim outrage worldwide, elicits only resignation- ostensibly to the will of God. Just because God allows it to happen doesn’t make it His act or make Him culpable. 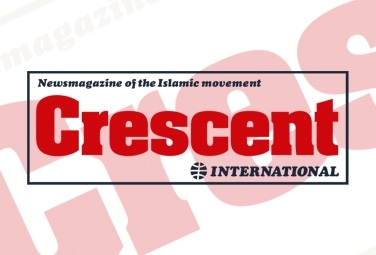 As usual, they have resorted to the Gulf attitude and disease of imagining that the solution to every Islamic and Muslim problem is money—and they have thrown a cheque of $270,000 at the estate of each of the crane victims as diyyah—to underscore the Shariah-followers that they are and the painfully poor people the pilgrims are! And tomorrow they may throw some more dollars to the stampede victims as if that is the solution to the problem. And the Muslim World will stand mute, waiting for the tragedy at the next Hajj. This must stop. And the first step towards a solution to the Hajj tragedy is for Saudis to wake up to the fact that Muslims will never accept that the Haram is the ownership of any nation-state. The Haram belongs to all Muslims, and the legacy of the Holy Prophet [SAW] and his companions [RA] are the collective patrimony of the Ummah; and, accordingly, Hajj is also a collective responsibility that must be discharged by, and to the satisfaction of, all. Even if Saudis had been competent, friendly to pilgrims and attentive to their heavy responsibilities, it would still have been a collective responsibility that could be taken away. Even less important activities are organised and managed by the congregations that partake in them. The World Cup, for instance, is organised by the Federation International de Football Association, FIFA, and not by Brazil, the best footballing nation or by England, where football was invented. And if doing this was necessary for a temporal affair, ritual it would have been even much more so for a spiritual one. But for Muslims, this oneness, this congregation of acts is a divine commandment and it underlies the theme and focus of the Hajj as the practical expression of the unity of humanity under God. Therefore, as the creators and promoters of disunity in the Ummah, the Saudis are the least qualified to organise or manage the Hajj. And what’s more: their latest demonstrated incompetence has removed any lingering doubts.